The bibliographies included on this website will be of particular help to those doing research for a paper (or for fun!). Throughout the site we have used the common abbreviations for both authors and titles, so please refer to the table of abbreviations below. A note on the chapter bibliographies: We have listed not only the author and title, but also the specific sections and lines that will be of most use to you. The bibliographies are divided by chapter, so you may want to check back to the textbook to see which is the best chapter in which to find what you’re looking for. Then click on that chapter number, under Chapter Materials, in the sidebar to the left to find the sources you need. Many of the sources listed in this section are readily available, either in inexpensive paperback editions or in the Loeb Classical Library editions published by Harvard University Press. 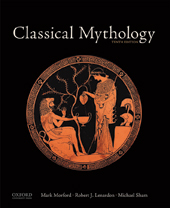 Most of the material referred to below can also be accessed from the Perseus Project website (www.perseus.tufts.edu), which has a fine selection of Loeb volumes available for online research. Andocides (Andoc.) On the Mysteries Myst. Apollonius Rhodius (Ap. Rhod.) Argonautica Argon. Valerius Flaccus (Val. Flac.) Argonautica Argon.